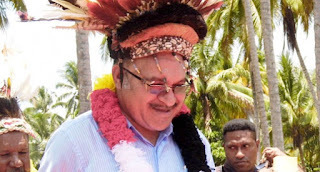 Home > all > news > PNG News > Opposition lying about PNG debt– Peter O’Neill is the best economic manager in PNG's history. Opposition lying about PNG debt– Peter O’Neill is the best economic manager in PNG's history. Peter O’Neill is the best economic manager in our country’s history. Despite what some misinformed commenters on social media and our political opponents are saying, there is no evidence of PNG having a debt issue. Today we are sharing with you the TRUE FACTS about PNG’s economy. The best measure of a nation’s debt is a statistic economists call the “Government Debt to Gross Domestic Product” and is measured as a percentage. Simply, it is comparing the level of government debt to how much money the country earns on a yearly basis. The highest this has ever been in our history was 71% in 2001, during Sir Mekere Morauta’s Prime Ministership. The lowest Debt to GDP level in our country’s history was in 2011 and was 23%. This occurred after four years of Peter O’Neill, possibly the best economic manager this country has ever had, serving as Treasurer. The current level is around 35%, which sits close to the average amount of debt PNG has had since independence. You will often hear the misinformed say things like the O’Neill government borrowed K20 billion during their term. People who use this as an argument against the PNC’s economic management simply do not understand how a national economy works. Under Peter O’Neill’s management the size of PNG’s economy has almost doubled, and our debt ratio has remained the same. The opposition are using a cheap political lie and spreading FAKE NEWS about our economy. The proof is plain to see for all those smart enough to understand it. Next time you hear the lie that PNG has debt issues refer them to this post, that shows the TRUTH.